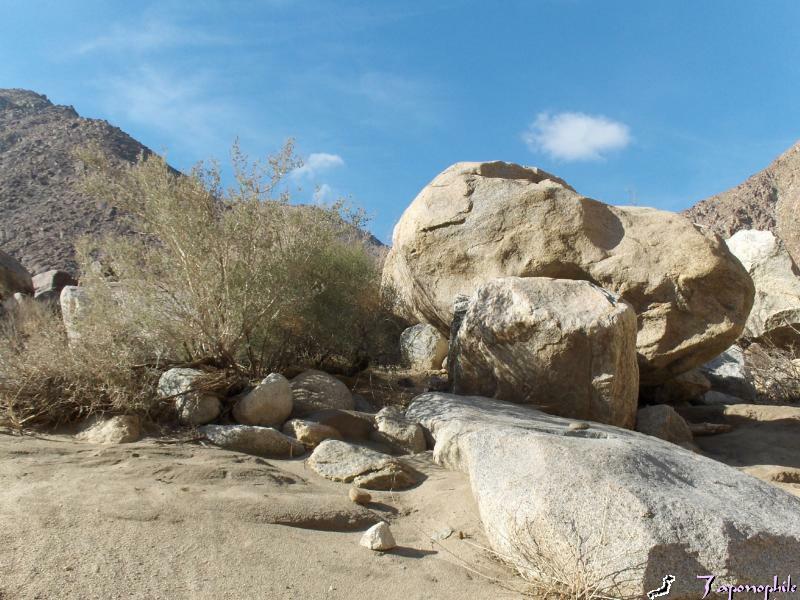 On this sunny day, the varied textures of plants and boulders stood out against the deep blue sky, dotted with fluffy, white clouds, making this a pleasant hike, as we continued up to see the amazing sight of a palm oasis within a desert canyon. We finally arrived at our destination, a lush palm oasis with flowing water. The California Fan Palm (Washingtonia filifera), is the only native palm in the western United States. It was named after our first president by German horticulturist, Herman Wendland, in 1879. 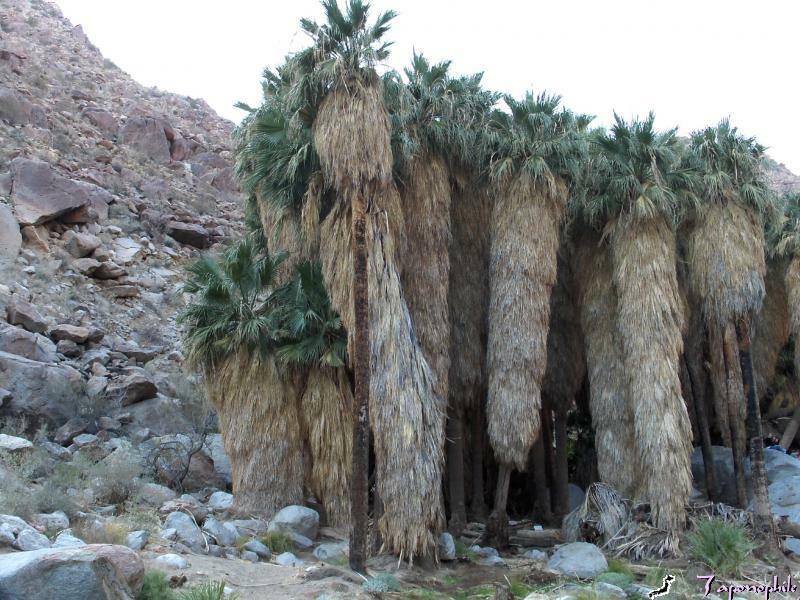 These palms grow to a height of up to 80 feet and may live 100-200 years, or until the next flash flood or fire. Their shallow roots and large leaf surfaces require that they live near water. Urban growth has threatened these trees by lowering the underground water table. Palm groves are found along creeks and deep gorges. 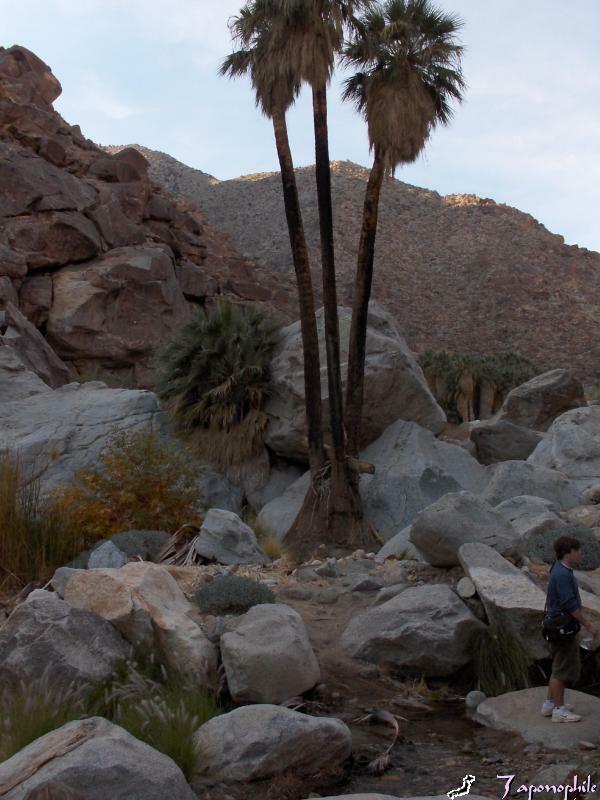 Last week Rich Luhr visited the only palm canyon in Arizona, located in the Kofa National Wildlife Refuge. 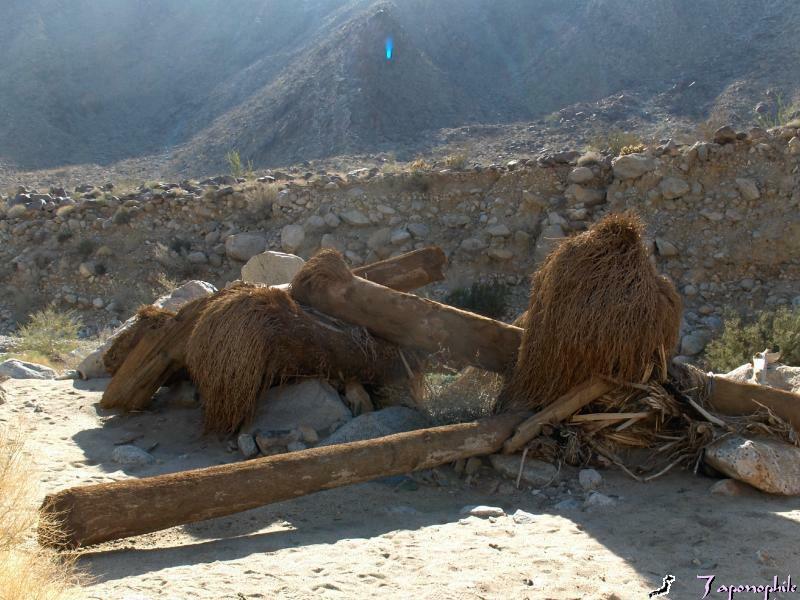 The Cahuilla Indians had a village in Borrego Palm Canyon because it supplied water, afternoon shade, and shelter from the winds. The palm trees provided the Indians with fruit and materials to make sandals, matting, baskets, ceremonial effigies, and housing structures. Notice the palm frond skirts, which protect the bark from water loss and insect predators. Unfortunately, some of these trees have lost their skirts due to fires started by careless hikers. 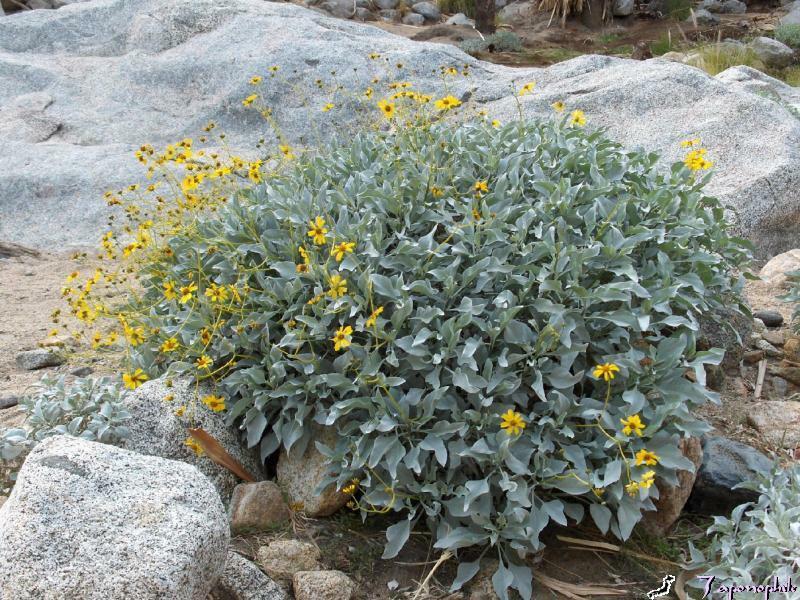 On this New Year’s weekend hike, we were delighted to see beautiful yellow flowers on this silvery-gray BrittleBush or Incienso (Encelia farinosa), a relative of the Sunflower. As we started back down, we could imagine the roaring sound of a flash flood as it surges down the canyon towards our campground and our Airstream with its raised Earth flag. 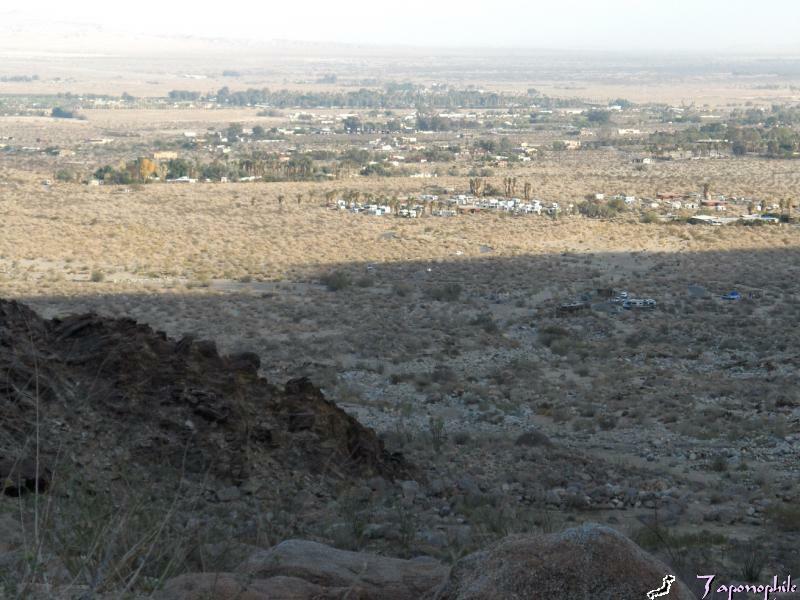 Our campground and nearby town of Borrego Springs came into view, and we could now appreciate how vulnerable we are to the natural elements such as water and fire. And we now have a renewed respect for our planet Earth and Mother Nature. Hiking the Palm Canyon Nature Trail reveals the drama of a massive, 100-year flash flood that raged through here in September 2004. A sudden thunderstorm drenched the mountains above, resulting in a huge waterfall and raging river crashing down the canyon pushing palm trees and boulders along the way. It destroyed several campsites and left the hook-up area under two feet of mud. 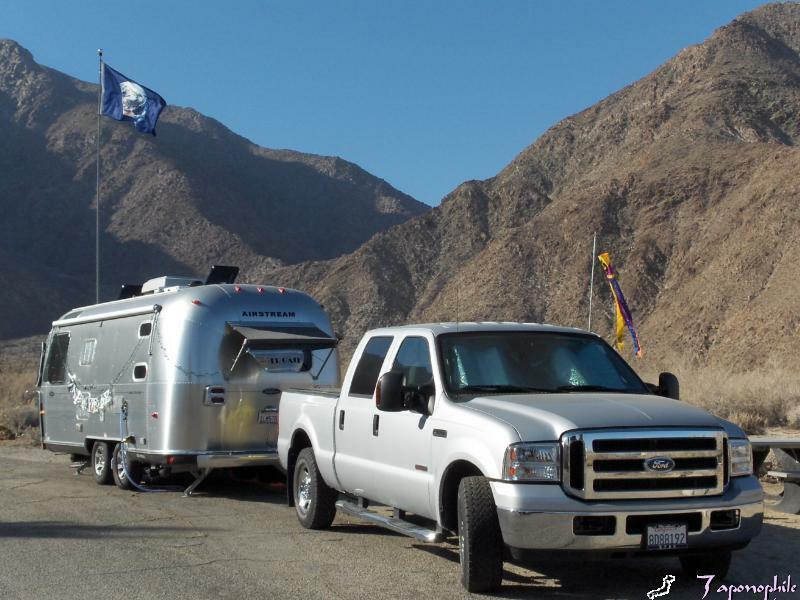 For a celebration of New Year’s and the one-year anniversary of our trailer, we raised our Earth flag at Palm Canyon Campground, in Anza-Borrego Desert State Park, CA., and hoped that it would not rain. 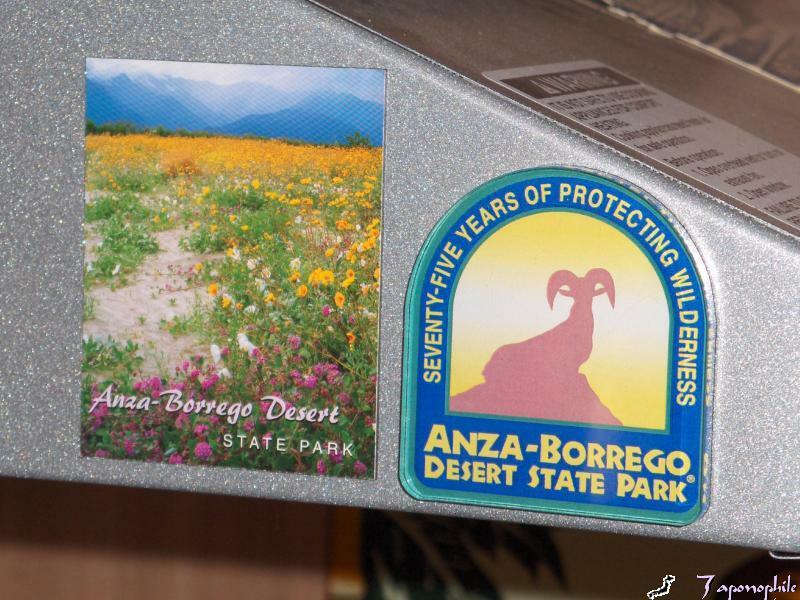 Anza-Borrego Desert State Park, with its 1600 square miles, is the largest contiguous state park in the United States outside of Alaska, and is now celebrating its 75th Anniversary. The first part of its name is attributed to Juan Bautista de Anza, the Spanish captain of the historic 1775-76 San Francisco colonial expedition, which passed through the area. 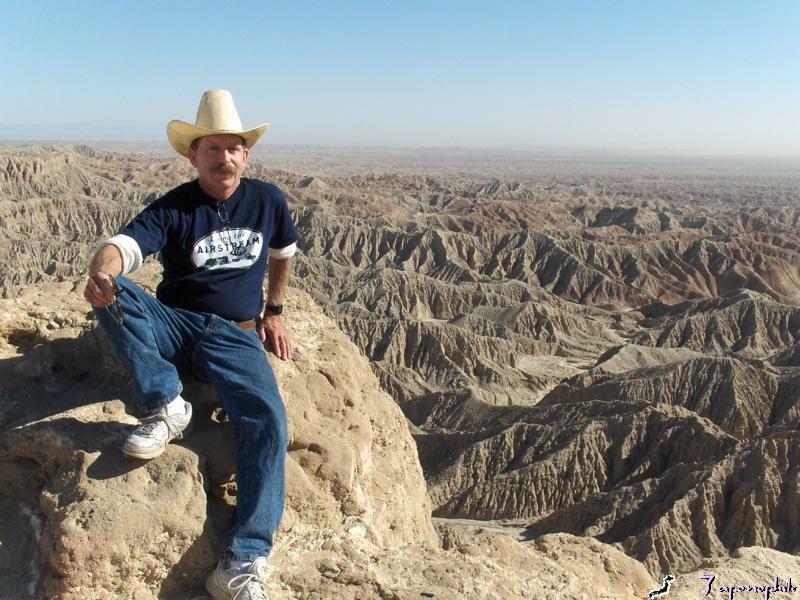 The second half of the name, Borrego, is Spanish for sheep. This park is one of the last refuges for the majestic, and endangered Peninsular Bighorn Sheep (humans have destroyed much of their habitat). This park also often has spectacular, spring wild flower displays. The weather turned out gorgeous for the most part, so I joined our friends, Michael and Theresa, on a hike up Palm Canyon. I checked the latest weather forecast to make sure there were no flash flood warnings, wore layers of clothing and took water (this time) for safety and comfort. 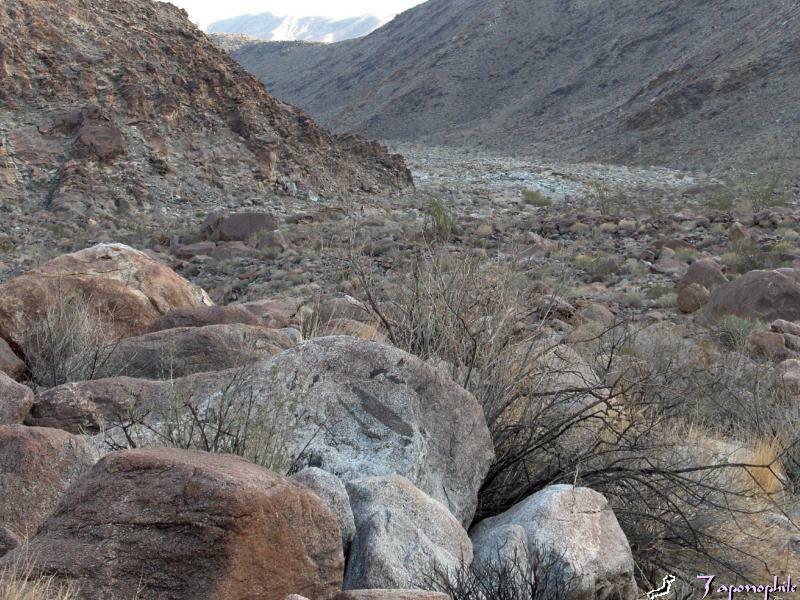 The Palm Canyon Nature Trail is a three-mile round-trip featuring a native palm oasis. I followed Michael and Theresa as we took in the panoramic view of the canyon near the beginning of the trail. Even here we see evidence of that massive flash flood. Palm trees lay scattered about like headless corpses, having lost their crowns and roots by the tumbling action of the turbulent water as they were brought down the canyon. One has only to gaze upon the sheer size of the massive boulders that came crashing down the canyon from the floodwaters to appreciate the powerful forces of nature. We’ll rest here for now. 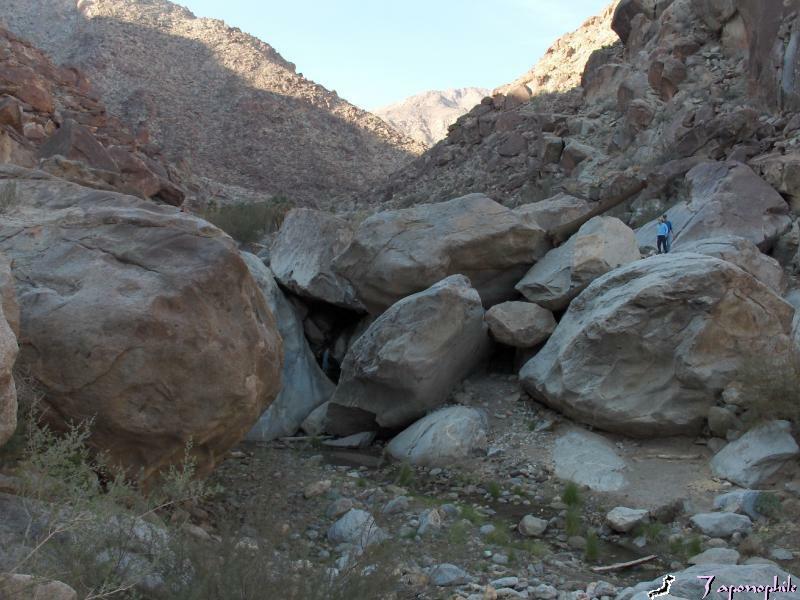 Then press on with our journey and explorations up Palm Canyon. 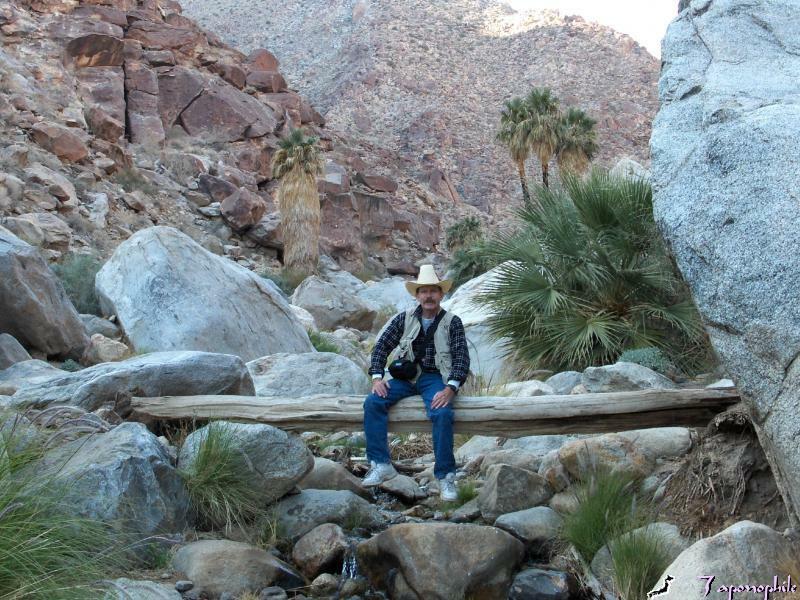 We’ll see what’s special about that clump of palm trees seen in back of me, after I enjoy sitting on this log awhile and listen to the trickling creek below. This is the History Safari Express. All aboard!!! As our Airstream Safari makes the rounds in Southern California, we will stop along the way and savor historical aspects and highlights. At times we will utilize our Renaissance fair and docent skills in bringing history alive to illustrate a historic point. 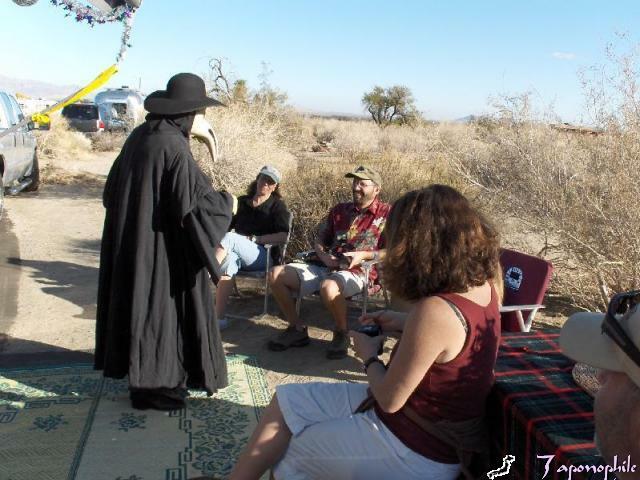 A recent example was that while camping at Anza-Borrego Desert State Park with the Luhrs’, I portrayed the Plague Doctor as Larry talked about the plague and how it still is a current concern. See Rich Luhr’s Dec. 19, 2007 Tour of America post, “Characters“. 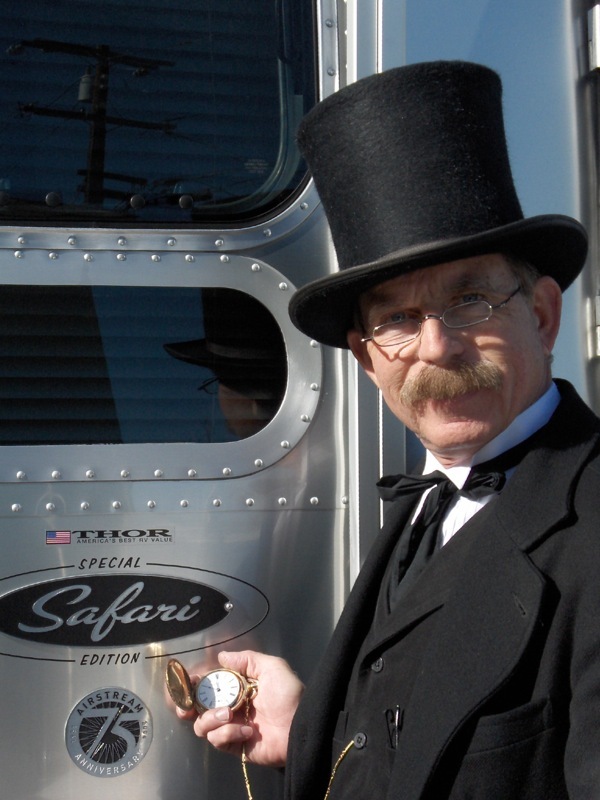 We will also share the ongoing history of our custom-ordered Safari built in 2006, the 75th Anniversary of Airstream. Two solar panels were installed during the build. We will touch on its performance history in a variety of settings and conditions. We will share our ongoing improvements, new ideas, items, and seasonal decorations that enhance its ambience. 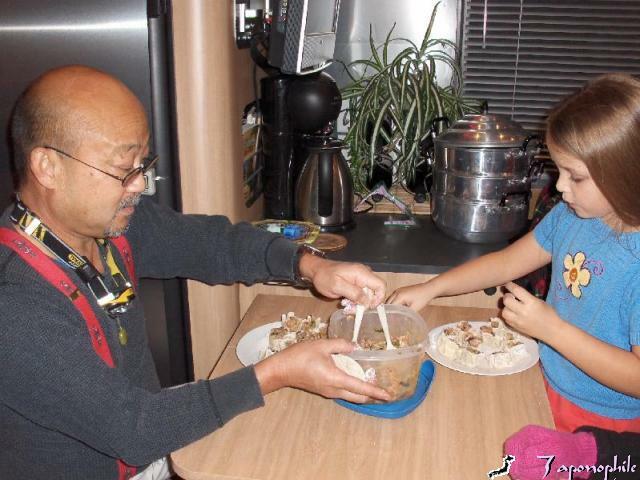 Larry enjoys cooking and might be enticed into discussing some of his techniques along with some historical notes on a variety of foods including Chinese cuisine. For our December outing at Anza-Borrego, Larry prepared jook (Chinese rice congee), which we shared with the Luhrs’ while discussing its value as food therapy. 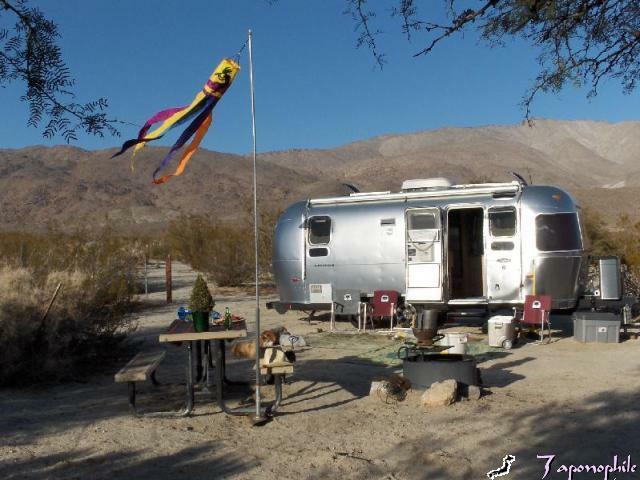 We returned to Palm Canyon Campground at Anza-Borrego Desert State Park for an extended New Year’s weekend celebration with our friends Bob and Theresa. I joined them for a mid-day side-trip in their 4WD over a wash to Fonts Point with a spectacular view of the colorful Borrego Badlands. Fonts Point was named after Father Pedro Font, the diarist on the second Anza Expedition to California in 1775, bringing colonists to establish the pueblo of San Francisco. Thank you for hopping on the History Safari Express. 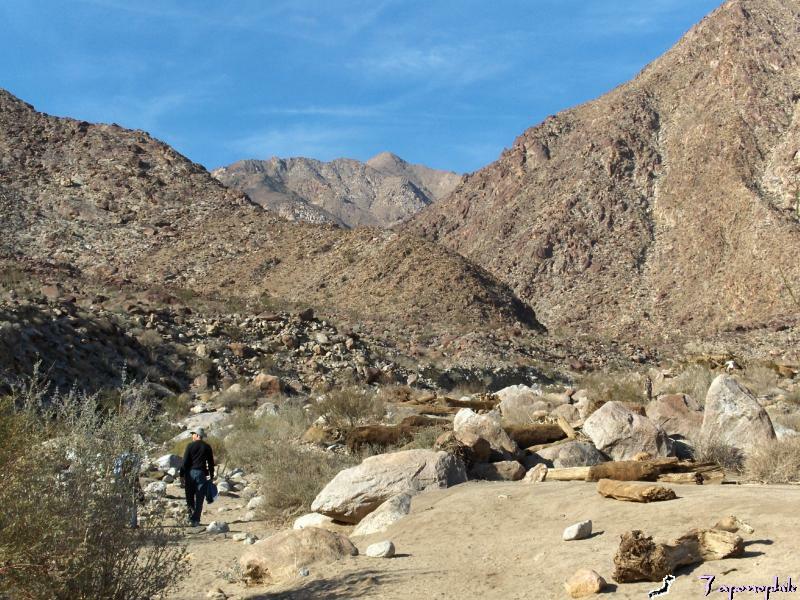 On our next stop, we will be taking a hike up Palm Canyon, the most popular canyon in Anza-Borrego Desert State Park, which is now celebrating its 75th Anniversary.